Sold to Generation Yers as “curated communities”, London's The Collective Old Oak is a pricey copy of 1930s modernist projects, stripped of their social agendas. It has been hard to miss the relentless PR campaign that has been ‘co-living’ this year – one we’re told will solve the housing crisis in London and recently evangelized by Patrik Schumacher at the World Architecture Festival in Berlin. For those missing the fanfare, co-living is the housing equivalent of co-working, aimed at solvent, yet asset poor, young professionals. It rests on a premise that Generation Y’ers are predominantly single, want flexibility, convenience, and value authentic ‘experiences’ over material possessions. Spatially, this plays out with an emphasis on communal spaces – the kitchen, living room – at the expense of private space, seen as a mere place to sleep. At its most elaborate, the communal space can include a plethora of restaurants, tearoom, bars, work spaces, laundries, roof terraces, fitness rooms and building apps to book events. And it’s a concept that’s gaining traction. Co-living, as this latest and marketable housing mode, now exists in many of our major cities; typically those with acute housing shortages. The first to dramatically scale this up – and self proclaimed co-living pioneers – have been developers The Collective Partners LLP with their The Collective Old Oak in Willesden, North West London. A self-contained behemoth, The Collective Old Oak hosts 400 co-working spaces and 546 bedrooms, varying from studios to standard en-suites, at an average cost starting £1040 per month. Yet it’s the 930m2 of communal space that apparently separate it from high-end student halls or generic luxury flats in the city. Here, young residents can enjoy “shared kitchens and lounges on every floor, communal entertainment spaces and luxury facilities including a gym, spa, cinema room, library, restaurant, bar, curated retail outlets, events spaces, roof terraces and more.” At Collective Old Oak you don’t live in an apartment block but a “curated community” – the catchall term curation used to describe how residents are chosen to the multiple events aimed at connecting people. These can range from mindfulness and meditation to networking events, business talks, workshops, film nights and live music. Left: 1934 advertisement for Isokon by László Moholy-Nagy. Right: communal spaces and services at The Collective. Built between 1933-1934, Isokon was designed as a form of shared living that moved beyond the nuclear family, heavily indebted to Le Corbusier’s ‘Vers une Architecture’. It featured 36 affordable apartments for young professionals that came fully furnished to encourage a minimalist lifestyle with a range of services available: from shoe-shining and cleaning; to bed-making and meal delivery from an on-site kitchen. Coates, in describing this avant-garde ethos explained “We cannot burden ourselves with permanent tangible possessions as well as with our new possessions of freedom, travel and experience”. 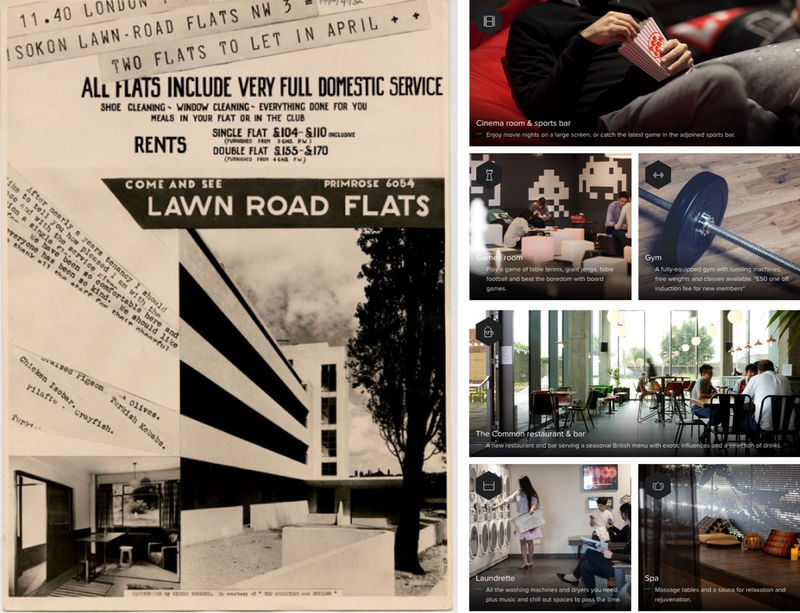 A building to live and work, Isokon offered a communal laundry, roof garden and the infamous restaurant ‘Isobar’. The clientele of Isokon, during its early history, were the unashamed intelligentsia and emigres of the era; the claims of an egalitarian, communal living somewhat incongruous with the exclusivity of the building. Left: “The Minimal Flat” in Isokon. Right: “Ensuite Room (Standard)” in The Collective. The method of this conversion was through built and unbuilt projects, with a sustained ‘propaganda’ campaign using journals, exhibitions, film, radio, lectures and that would take modernism from a peripheral discourse to subsequent post-war dominance. Underlying this was a social agenda that held civic value above monetary motives; a belief that a decent standard of life should be available to all through healthcare, housing and work reforms; that all this could be achieved through planning the future. Another such example that took the ideas of Isokon but demonstrated an ability to merge the political, social and aesthetic was Kensal House, built in 1937 as the first modernist housing estate in Britain. A collaboration between Maxwell Fry, a founding member of MARS, and the prominent social reformer Elizabeth Denby, Kensal House radically deviated from the brief – set by the Gas Light and Coke Company – to cheaply house ‘slum dwellers’ while showcasing gas technology. Left: The resident band in a still from a 1937 film on Kensal House (British Film Institute). Right: according to The Times, a DJ booth is set to be installed in The Collective Old Oak’s laundrette. Communal spaces, Kensal House (1937) / The Collective Old Oak (2016). It did so through a scheme Fry would dub an “urban village”: two self-contained structures that provided 2 to 3 bedroom apartments with balcony gardens and a heady mix of community facilities and services. The long list of communal facilities included: workshops, a communal laundry, nursery, community centre, allotments, clubroom and canteen facilities. Residents could join the Feathers Club, attending sewing, metalwork and woodwork classes or borrow a book from the buildings library. They could get supper and tea from the communal canteen while listening to their own resident band or socialise with neighbours playing darts and other games. On top of this, Kensal House was run as a genuine collective that made decisions on the everyday upkeep of communal areas and allotments, in describing this ethos, Denby elaborates “the spirit of the estate is that the people run it themselves”. The self-management of the estate and amenities included had far wider reaches. This was in particular for housewives who, as Elizabeth Darling describes in ‘Negotiating Domesticity: Spatial Productions of Gender in Modern Architecture’ were liberated “from time-consuming housework” and able to participate in a democratic decision making process. Left: Kensal House (1936). Right: The Collective Old Oak (2016). 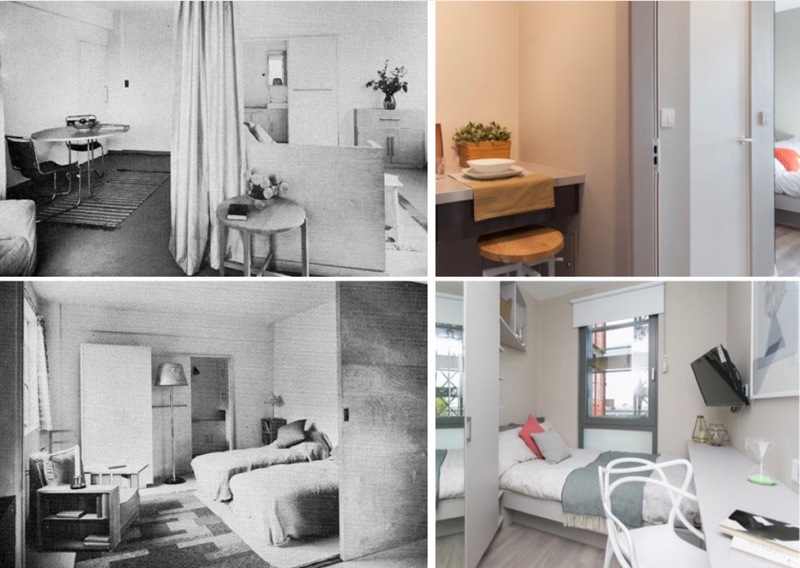 Both Isokon and Kensal House, as examples under a wider MARS discourse, were instrumental as experiments showing the potential for modernism to solve mass housing needs, through a rethink of what housing is and can be. The discourse was against – and developed as a reaction to – the laissez faire city where housing was commodified, deregulated and market dominated; leading to the situation of housing crisis as normality. Kensal House, in particular, would become a prototype for the architecture of the welfare state and subsequent post-war modernism. While this has been criticised for an elitist, formalist and top-down approach; the idea of housing as a universal right should be rightly praised. I agree with Matthew Stewart's conclusion that The Collective is a commodification of other collective forms of living, but disagree in believing it is a bad thing. There is a reason that the experiments between the war haven't taken off and become a major form of living space. In order to run them they require a large amount of time and money. Governments and social organisations simply do not have that money or time to spend on something when, like this, there is such a risk that it may not work or be popular. In the free market, risks are taken and money is available for them. This means that bad ideas are rooted out and made better, gradually leading to good ones. I know nothing about whether The Collective is a good space to live or a bad one, but if it is the latter it will doubtless not be as successful as first thought, or new ideas will in time improve it. Cheap collective living is a good idea, if it can be done well, and the best way of doing it is through commerce, not social planning by governments and well-intentioned architects. I think Stewart's point is that the language of social movements has been co-opted to sell housing developments that give the impression that choosing this style of living is a way of participating in solving urban problems. Although It may be a solution to some young single's housing, it follows a trend in modern development to use the "green" "affordable housing" language to protect all development from criticism. Those who criticize are characterized as unconcerned with global warming and housing for the poor. Matthew Stewart's connection between co-living and past models here deserves praise, but I'm not sure how he supports his conclusion, other than stating with little support that MARS was civic-minded and The Collective is purely profit-based. Did the Gas Light and Coke Company not make any money from Kensal House? And is it not possible for The Collective to believe they are providing an important social benefit while also making money from it? Certainly from my interactions with those in the co-living industry (admittedly people from a different company to The Collective) there is a strong sense that the service they are providing responds to deep cultural shifts that have been ignored by other players in the housing market, including governments. I don't wish to align myself with Patrik Schumacher, and I don't think co-living will "solve" the housing crisis, rather provide a relatively small number of homes for people whom the lifestyle suits. Yet it seems to me that this attempt to discredit co-living stems more from a nostalgia for the old welfare state than a substantive criticism of the trend itself--and if that's what Stewart really wishes to complain about, he can join the queue. Meanwhile, is the banality of The Collective's architecture and their lack of awareness of architectural history any surprise, given that seemingly intelligent architects always attempt, in the way shown above, to distance themselves from ideas which cater to new cultural and economic trends?